In The Valley Below are a socially conscious duo that are on the forefront of raising awareness of important issues through their music. Consisting of married couple Jeffrey Jacob and Angela Gail, the indie rock infused dream pop sound created by In The Valley Below is aesthetically pleasing on all levels. They have a new project coming out (today!) called The Elephant EP, and it is both socially aware and sonically satisfying. “Bloodhands (Oh My Fever)” is the first – and one of the most impactful songs – on the five song EP. It was inspired by the Michael Brown shooting in Ferguson, MO and racial tensions between people and the police. Second track “Pink Chateau” brings with it lighter instrumentals and more of a springtime vibe, as it begs you to “slow down” and “simmer down” which aren’t bad bits of advice, if we’re being honest. “Hold On Tight” has more of a whirring, pop sound and then breaks down into some insane old school guitar solos to really throw you off guard. 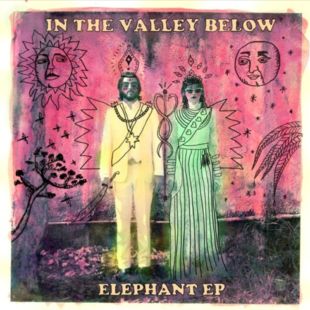 But we’ve come to expect the unexpected from In The Valley Below, as they blend so many genres and weave show stopping tempo and key changes that should throw you for a loop, but really make their tracks that much more intriguing. The same can be said for fourth track “Break Even”, which has such intricate percussion parts that it completely changes what we had begun to think was the established vibe of the EP. Fifth and final track “Elephant” is the standout ballad, slowing the tempo to a crawl and really allowing you to revel in the lush, vibey vocals. With so much going wrong in the world today, there are a plethora of songs inspired by the darker side of life. The uniqueness of In the Valley Below is that they do not phone in the music or the message when they create their art. They believe that in order to have the most effect, they must reach the largest audience with genuinely good music, and it shows. This EP comes from a authentic mindset, raising awareness for important issues, and it doesn’t hurt that the songs are great to listen to. For more information about In The Valley Below, you can visit their website at inthevalleybelow.com.